For other people named Richard Carpenter, see Richard Carpenter (disambiguation). 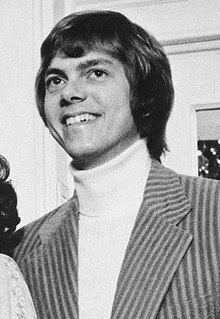 Richard Lynn Carpenter (born October 15, 1946) is an American musician, record producer, songwriter, and music arranger, best known as one half of the sibling duo The Carpenters alongside his sister Karen. He has had numerous roles including record producer, arranger, pianist, keyboardist, lyricist, and composer, as well as joining with Karen on harmony vocals. Richard Lynn Carpenter was born at Grace-New Haven Hospital (now called Yale-New Haven Hospital) in New Haven, Connecticut, the same hospital where his sister Karen was later born. His parents were Agnes Reuwer Tatum (a housewife) (March 5, 1915 – November 10, 1996) and Harold Bertram Carpenter (November 8, 1908 – October 15, 1988). His father was born in China, where his own parents were missionaries, and was educated at boarding schools in England, before working in the printing business. Carpenter was named after his father's younger brother, Richard Lynn Carpenter. Carpenter and his uncle both married women named Mary. Richard and his sister were baptized into the United Methodist Church and as children were part of the Methodist Youth Ministry. Carpenter frequently played the piano while his younger sister, Karen, played baseball outside. He and Karen also liked to listen to the children's records their father bought for them when they were young. Richard was introduced to Perry Como and Ella Fitzgerald, among many others through his father's record collection, and by age 12, he knew he wanted to be in the music industry. His first public appearance as a musician was at age 16 in New Haven. Along with two older friends, a group was formed and they played at a local pizza parlor. Richard joined the venture to earn money to buy a car. The Carpenter family moved from New Haven to Downey, California, in June 1963. They wanted Richard to further his music career, and the family was tired of the cold New England winters. Carpenter studied music at the California State University at Long Beach. There, he met Frank Pooler, a conductor and composer who wrote the lyrics to the Christmas classic "Merry Christmas Darling" in 1968. Richard also met good friend, John Bettis, who co-wrote songs with Richard. Carpenter created the Richard Carpenter Trio in 1965 with sister Karen and friend Wes Jacobs. Richard played the piano, Karen played the drums, and Wes played the tuba and bass. In 1966 the Richard Carpenter Trio played "Iced Tea" and "The Girl from Ipanema" at the Hollywood Bowl Battle of the Bands. They won the competition, and shortly afterward recorded three songs at RCA Studios: "Every Little Thing", "Strangers in the Night", and the Carpenter original, "Iced Tea". "Iced Tea" is the only recording that was officially released to the public. Although Spectrum played frequently at LA-area nightclubs such as Whisky a Go Go, they met with an unenthusiastic response—their broad harmonies and avoidance of rock 'n' roll limited the band's commercial potential. Yet Spectrum was fruitful in another way, providing the raw material of future success: Bettis went on to become a lyricist for Richard's original compositions, and all the other members, except Leslie Johnston, went on to become members of the Carpenters. Richard and Karen signed with A&M Records on April 22, 1969. "Let's hope we have some hits," Herb Alpert told the two. According to Richard, Alpert gave them artistic freedom in the recording studios, but after Offering, their first album, was released and wasn't a big seller, it was rumored that some of A&M's people were asking Alpert to release the Carpenters, but he believed in their talent and insisted on giving them another chance. Alpert suggested that the Carpenters record a Burt Bacharach and Hal David song called "(They Long to Be) Close to You" written in 1963. Though Richard worked up an arrangement only after Alpert's insistence, his arranging talents clearly shone in the finished product. His arranging and musical talents, as well as Karen's vocals, helped the song climb to #1 on the Billboard Hot 100, where it stayed for a month. "(They Long to Be) Close to You" gained public recognition seemingly overnight. According to Richard, even though the song became popular overnight, the Carpenters themselves did not. Sitting at home one night, Richard was watching TV and saw a commercial for Crocker National Bank. He recognized the voices of Paul Williams and Roger Nichols, two A&M songwriters on the commercial's theme song "We've Only Just Begun." Richard made some calls to confirm their involvement, and asked if there was a full version of the song, which Williams affirmed. Carpenter managed to turn the bank commercial jingle into an RIAA-certified Gold record. It peaked at #2 on the Billboard Hot 100, and has become a popular wedding song. The song also successfully launched the careers of Nichols and Williams, who went on to write multiple hits for the Carpenters and many other artists. While Karen was suffering from the anorexia nervosa that would ultimately lead to her death in 1983, in the late 1970s, Richard suffered from insomnia, panic attacks, depression, and an addiction to Quaalude, a sedative and hypnotic medication. Author James Gavin noted in his New York Times review of Randy L. Schmidt's biography Little Girl Blue: The Life of Karen Carpenter (2010): "His mother is said to have given him his first pill," an observation that was previously portrayed in the CBS-TV television film The Karen Carpenter Story (1989) and commented on in several of that made-for-TV movie's reviews, which also noted that Agnes (their mother) had been taking them under prescription and thus thought they were safe. At the time he sought help, Carpenter had a doctor's prescription for Quaalude as a sleep aid, but his use had gotten out of hand. A reviewer of the BBC biopic Only Yesterday: The Carpenters Story (2007) notes: "As their fame grew, cracks began to show in their wholesome facade. An insane touring schedule began to take its toll and Richard took refuge in heroic doses of quaaludes. Meanwhile, Karen started worrying about her weight. The worrying became obsession. The cracks became faultlines. The centre could not hold." Dr. Gabe Mirkin wrote in "The sad story of Karen Carpenter" (February 15, 2014), "In those years, you could tell that something was wrong because the Carpenters frequently cancelled appearances. She appeared unhealthfully thin, weighing only 90 pounds when she was 25. Richard appeared to be forgetful, and it was later found that he was addicted to Quaaludes. In 1978, the Carpenters stopped touring and in 1979 Richard went into treatment to cure his dependency on this drug." Nick Talevski similarly observes in Rock Obituaries – Knocking on Heaven's Door (2010): "Constantly on the road since 1970 with their Vegas-style act, both Karen and Richard Carpenter were in ill health by late 1975. With Karen's weight down to 80 pounds, a tour had to be cancelled. Richard, meanwhile, had become addicted to a prescription drug, Quaalude." By late 1978, Richard was receiving "much encouragement (and browbeating) from family and friends, to ‘face the music.’" Finally, in January 1979, semicomatose on Quaaludes, Richard fell down a flight of stairs backstage and finally confronted his addiction." He checked into a six-week treatment program at the Menninger Clinic in Topeka, Kansas, and kicked his habit. "For any number of reasons, the first three weeks were 'hell on earth,' Richard says, 'but after that, things really started to change, and of course, all for the better.' Still, all of this had been a monumental change for Richard and he decided it was wise not to delve right back into work, and to pretty much take the rest of 1979 off, all the better to get accustomed to his changed fortunes." 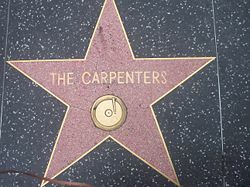 On October 12, 1983, eight months after Karen's death, the Carpenter family celebrated the unveiling of The Carpenters' new star on the Hollywood Walk of Fame. Carpenter said in his speech, "This is a sad day, but at the same time a very special and beautiful day to my family and [me]. My only regret is that Karen is not physically here to share it with us, but I know that she is very much alive in our minds, and in our hearts." When time was all we had to spend. In 1996, at the suggestion of music writer Daniel Levitin, Carpenter recorded and released Richard Carpenter: Pianist, Arranger, Composer, Conductor, which included reworkings of many Carpenters favorites, including hits and album tracks, and ends with "Karen's Theme", which Carpenter composed for the television film, The Karen Carpenter Story (1989). Carpenter released the DVDs Gold: Greatest Hits (2002), a repackaging of the VHS/Betamax Yesterday Once More (released in 1985, two years after Karen's death in 1983) that contains all the videos from Yesterday Once More, and Interpretations (2003), which updates the original, VHS/cassette tape released in 1995 and includes footage from the Carpenters' five TV specials and TV series from 1971–1980. The DVD follows the compilation album of the same name, which had been released earlier the same year, and includes eleven Carpenters' tracks never before available on DVD (including "From This Moment On", an outtake from the Carpenters' fifth television special), all of them digitally enhanced and remastered in stereo audio. On his 62nd birthday in October 2008, at a luncheon for The Foreign Correspondents Club of Japan, Carpenter announced plans for "his career comeback – dubbed 'Richard Carpenter Strikes Back'"—which included "the re-release of a Carpenters Christmas album and a tribute album featuring cover versions of Carpenters songs." The 43-minute film Superstar: The Karen Carpenter Story (1987) was directed by Todd Haynes and was withdrawn from circulation in 1990, after Haynes lost a copyright infringement lawsuit filed by Richard. The film's title is derived from The Carpenters' 1971 hit song, "Superstar." Over the years, it has developed into a cult film and is included in Entertainment Weekly's 2003 list of top 50 cult movies. Carpenter helped in the productions of the documentaries Close to You: Remembering the Carpenters (1997) and Only Yesterday: The Carpenters Story (2007). Carpenter funds an annual scholarship/talent show for people with artistic abilities that is held at the Thousand Oaks Civic Center. Carpenter used a wide range of keyboard instruments including grand piano, Hammond organ, Wurlitzer electric piano, ARP Odyssey, Fender Rhodes electric piano, harpsichord, celesta, synthesizer and tack piano. His favourite grand piano was Baldwin. In the '70s, he initially endorsed and used Wurlitzer electric pianos before switching to the Fender Rhodes electric piano. He says that at A&M Studios, he regularly used a Steinway piano on the Carpenters' records with the exception of the A Song for You album in which he played a Baldwin piano which was autographed by Liberace. On stage, he had both a Wurlitzer electric piano and grand piano, but after switching to the Fender Rhodes, he would simply alternate between the three for different songs on stage. He has described the sound of the Wurlitzer electric piano as "warm" and "beautiful" and via overdubbing in the studio, he would regularly supplement his grand piano with a Wurlitzer electric piano to thicken the sound, thus creating a distinctive keyboard sound. On the song "Happy" on Horizon, he made his earliest experiments with the ARP Odyssey synthesizer. In 1984, Carpenter married his adopted cousin, Mary Rudolph. Her brother, Mark Rudolph, was the Carpenters' road manager as well as the radio call-in "contestant" in the [Oldies] "Medley" on the album Now & Then (1973). The couple had been dating since the late 1970s. A young Mary made a cameo appearance in the Carpenters' promotional video for the song "I Need to Be in Love" (1976). Richard and Mary Carpenter have five children: Kristi Lynn (the name Karen would have given to a daughter) was born on August 17, 1987; Traci Tatum on July 25, 1989; Mindi Karen (named after her late paternal aunt) on July 7, 1992; Collin Paul in 1994; and Taylor Mary in 2000. The children and Richard sometimes perform music together at various Carpenter-related events. Today the family resides in Thousand Oaks, California. Carpenter is a Mopar automobile enthusiast, and original owner of a 1970 Plymouth Barracuda with the unusual 440+6 V8 engine and automatic transmission package. 1987 "Something in Your Eyes"
^ "Carpenters biography". Richardandp KarenCarpenter.com. 2005. ^ Dionne Warwick (2010). "Forward". Little Girl Blue: The Life of Karen Carpenter. By Schmidt, Randy L. Chicago: Chicago Review Press, Inc. ISBN 978-1-55652-976-4. ^ a b c Gavin, James (August 6, 2010). "Sorrow in Her Voice". The New York Times Book Review. ^ a b Schmidt, Randy L. (2010). Little Girl Blue: The Life of Karen Carpenter. Chicago Review Press. ISBN 9781556529764. ^ Coleman, Ray (1994). The Carpenters: The Untold Story. p. 30. ^ Schmidt, Randy L. (12 April 2018). "Yesterday Once More: The Carpenters Reader". Chicago Review Press – via Google Books. ^ a b Lieberman, Frank H. (November 17, 1973). "A Talented Brother and Sister Act Which Represents Clean, Wholesome Entertainment". Billboard. Nielsen Business Media: C-6. ISSN 0006-2510. Retrieved October 5, 2017. ^ Coleman, Ray (1994). The Carpenters: The Untold Story. p. 48. ^ Samberg, Joel (February 4, 2013). "Remembering Karen Carpenter, 30 Years Later". NPR. Retrieved October 5, 2017. ^ "John Bettis". Nashville Songwriters Hall of Fame. Retrieved 2017-03-18. ^ Weiskind, Ron (December 31, 1988). "Why: Missing From Carpenter Story". Pittsburgh Post-Gazette. ^ a b c Sanello, Frank (January 1, 1989). "`A Puzzle For The Ages`: Film Chronicles Carpenter`s Fall But Can`t Answer Why". The Chicago Tribune. ^ jamdog (April 11, 2007). "Only Yesterday – The Carpenters Story". Aerial Telly. ^ Mirkin, Dr. Gabe (February 15, 2014). "The sad story of Karen Carpenter". Village-News. ^ Talevski, Nick (2010). Rock Obituaries – Knocking on Heaven's Door. Omnibus Press. ^ a b c "Biography". RichardAndKarenCarpenter.com. p. 9. Retrieved September 1, 2014. ^ Schmidt 2010, p. 292. ^ Time, Richard Carpenter. "Recording for this album commenced on June 26, 1985, with the final session in mix-down occurring on July 5, 1987." ^ Daily Mail Reporter (15 October 2008). "Yesterday once more: Richard Carpenter announces singing comeback as he pays emotional tribute to late sister Karen". Daily Mail. ^ AP Photo (October 2008). "Take a Look At Carpenters In Pictures: Richard Carpenter – a comeback?". Smooth Radio. ^ Holden, Stephen (November 8, 1998). "FILM; Focusing on Glam Rock's Blurring of Identity". New York Times. ^ "Carpenters Fans Ask-Richard Answers Archive". www.richardandkarencarpenter.com. ^ Hoerburger, Rob. "Karen Carpenter's Second Life". New York Times. Retrieved 4 August 2015. [I]n 1984, the year after Karen died, he married his cousin Mary Rudolph and is now the father of four. ^ Schmidt 2010, pp. 297–298. ^ Schmidt, Randy; Warwick, Dionne (May 17, 2010). Little Girl Blue: The Life of Karen Carpenter. Chicago Review Press. pp. 297–298. Retrieved January 8, 2016. ^ "Richard Carpenter's 1970 Chrysler Barracuda". Jay Leno's Garage. 19 September 2016. Retrieved 21 September 2016. ^ Carpenter, Richard. "Richard and Karen Carpenter – Official website". Retrieved 2008-01-17. ^ "RIAA Gold and Platinum Search for singles by the Carpenters". Retrieved 2008-07-03. Schmidt, Randy (2010). Little Girl Blue: The Life Of Karen Carpenter. Chicago Review Press. ISBN 978-1-556-52976-4.